Margaret Peavy Hitt passed away almost nine years ago. That's it. Pretty short time in the grand scheme of my personal genealogy. When I discovered Margaret was a third cousin of mine, this notion made me a little sad. Like Margaret, I have lived a large portion of my life in the state of Georgia. In fact, from about 1997 - 2000, I lived less than an hour's drive from her! I sure wish we could have met. · The Women's National Press Association was founded in 1882, but women were not allowed into the male dominated National Press Club until 1971. · Nellie Bly pioneered investigative journalism in the late 1880's in many ways. The most staggering example was by pretending to be insane and admitting herself to an insane asylum to expose abuse of the mentally ill.
· Anna Northend Benjamin was one the first female war correspondents during the Spanish-American War. She claimed, "you think it ridiculous my being here, you are laughing at me wanting to go, that's the worst of being a woman." Not only did she go, but she endured nicely and even scooped her competitors. · The Muckraker movement of the late 19th and early 20th centuries was helped along by a woman, Ida M. Tarbell. · According the 1900 U.S. federal census, there were more than 30,000 journalists in the United States. Less than 8% of them were women. Given these tidbits of information, I would classify any woman involved with newspapers and journalism well into the 20th century a pioneer for women in that field. That includes Margaret Peavy Hitt. According to Margaret's obituary, she was actually following in her mother's footsteps. Katherine McGaw Peavy Poole was one of the first women reporters for the Hearst owned Georgian newspaper. When it's publication ceased, she went on to write for The Atlanta Journal. Furthermore, newspaper reporting is also found in Margaret's paternal side. Her uncle, Arthur Peavy, was a reporter for the Miami Herald. It was stated, "Mrs. Hitt was a former City Room general assignment reporter, columnist and feature writer for The Atlanta Journal and The Atlanta Consitution. During her junior and senior high school days, she worked every summer (without pay) as a copy girl for The Georgian newspaper." 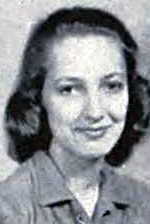 During World War II, Margaret wrote a daily column about military accomplishments of Georgians in the armed forces. She even interviewed Mrs. Eleanor Roosevelt when her husband's funeral train stopped in Atlanta. After the war, Margaret wrote the "Peachtree Parade" society column for The Atlanta Journal. Margaret was a 1939 graduate of Washington Seminary in Atlanta and attended Louisiana State University. She was secretary of the 1941-42 Atlanta Debutante Club and wrote the daily column, "Debs Daily Doings By One of Them" anonymously for The Atlanta Journal. At her debut party, Margaret carried a bouquet of orchids given to her by Margaret Mitchell. Yes, that Margaret Mitchell, author of Gone with the Wind. Margaret was a member of various organizations, including The National Society of Colonial Dames of America, Historic Oakland Cemetery, The High Museum of Art, and The Georgia Historical Society. Upon her death, it was asked that contributions be made to the Historic Oakland Foundation, the cemetery in which she was laid to rest. Yes, we must be kin! Rest in peace, cousin. Even though we never met, please know your legacy and influence live on. Hi Stephanie, I am enjoying your posts. I am a niece of Margaret Hitt and live in Roswell,Ga. My mother ,Suzanne Peavy is her half sister. So nice to meet you Catherine!